Phaeden sent me a new beta version of his Twentynine Palms ArmA 2 map (thanks Phaeden!) a while ago and I got the privilege to play a bit more on it. Today I played in a location named "Camp Phaeden", which looks like a MOUT training area. The training mission I created was simple. What I got out of it, not so. A bit of seemingly unrelated background. It happened a couple of weeks ago, during a relatively large online coop match in Iron Front. You know how large online matches go: everybody doing his own thing, teaming up eventually only when things go awry. So I was there, doing my own thing and I bumped into this guy who was hiding in a ditch along other guy. Well, I like to team up, so I joined the hideout and we started chatting about the challenge ahead. It was a enemy-held village with infantry roaming in the streets and one tank in the outskirts. Nasty stuff. I knew the place very well, because I just respawned after 2 consecutive deaths at this place of hell. All around us, other players were arriving in assorted vehicles and even tanks, getting blown off before shooting or dismounting and charging towards a quick death. The guy in the ditch said "let's move to that forest behind us, stay clear of the tank's sights and snipe the hell out of the infantry in the village. Then we infiltrate into the village". His plan worked like a charm and although we struggled a bit with the attrition of infantry, we got into the streets of the village. By the game's end, I almost forgot about this. Just another of those respites from the total chaos of massive online matches. Fast forward to today. 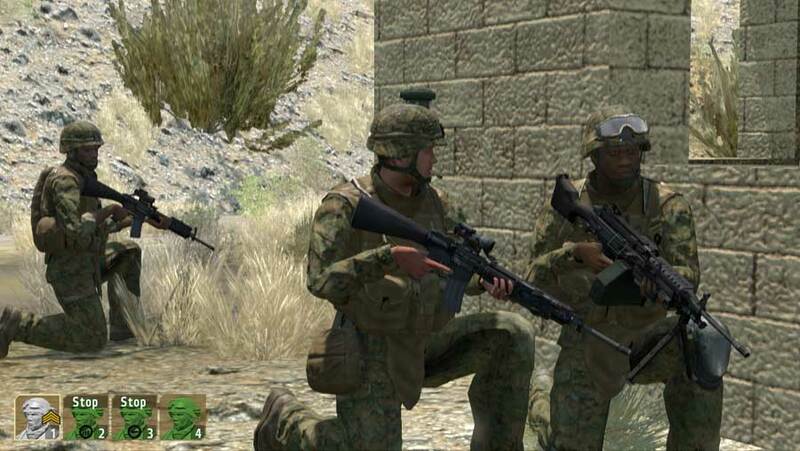 I am training with a USMC fire team (AI Marines to whom I can switch to) in a urban area. The mission is to advance along a street. Enemy opposition are insurgents. 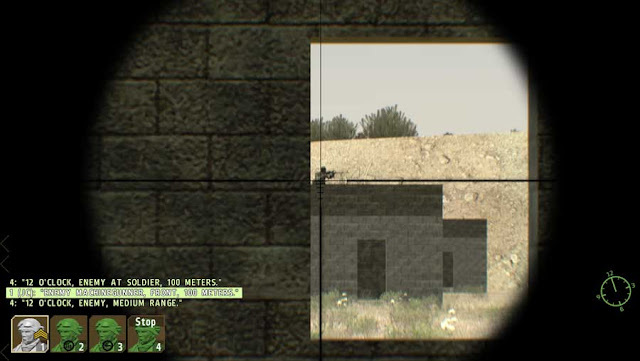 There are some MGs in the roofs of the buildings near the objective and a squad of infantry patrolling the streets. This is the street we are supposed to move along. 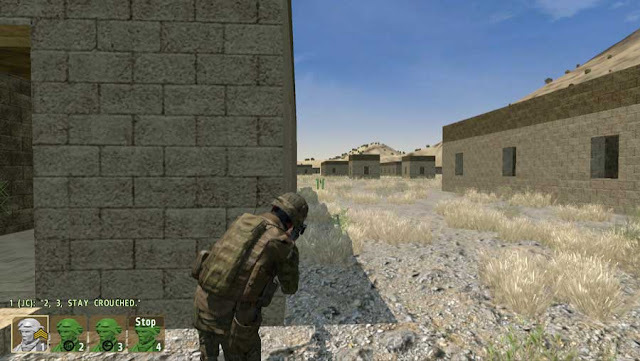 An enemy MG is on top of the building in the far background. The mission can't be accomplished without taking out that MG position in the roof. How to do it? So many possible courses of action! Destroy it by fire? Suppress it and assault it? Direct assault under the cover of smoke? What about the enemy infantry patrols? They are gonna get us with our pants down while we are advancing focused in the MG position. Small scenario, tactical puzzle with many pieces. This is the point where I remembered the "guy in the ditch". Surely the sniping bit of his approach was useful and thereby used. Different place, same approach. A careful selection of a keyhole position to take out the a portion of the enemy force from the distance. 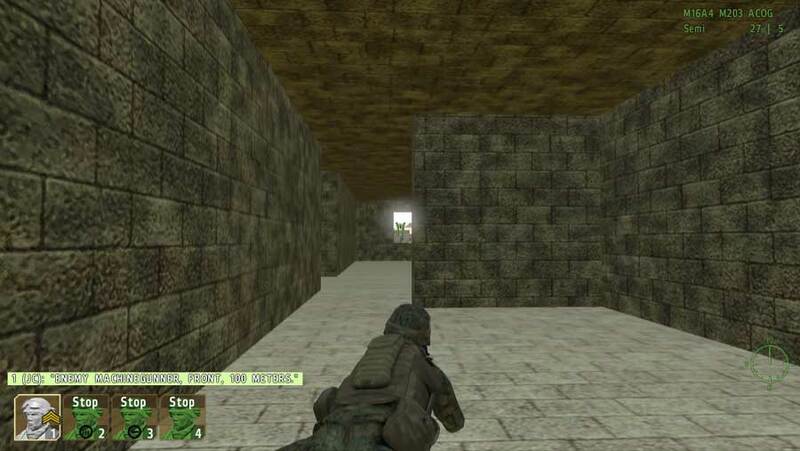 The enemy MG position being targeted. Two shots and he goes down. But there was something else that I could see and it was not visible from the sights of my rifle.